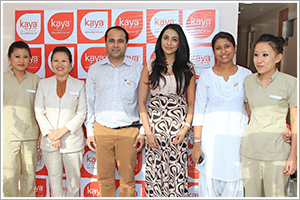 Kaya Skin Clinic unveiled by the Parvathi Nair making the launch occasion a starry occasion. Kaya Skin Clinic, pioneers in specialized skincare service, expands its presence in Bangalore with the inauguration of its tenth clinic in Bangalore. The new clinic was unveiled by the popular (South) Indian film actress and model Parvathi Nair, making the launch occasion a starry occasion. The new clinic strategically located at Hosur Sarjapur Road Layout (HSR Layout), an IT corridor between two large IT centers - the Electronic city and Whitefield, is bound to give the professionals a rejuvenating break. Kaya was launched with a singular objective of delivering radiant skin, using state of the art technology available around the world. They recognized an untapped potential in the specialized skin services and have since become a pioneer in providing quality care, specifically targeted towards Indian skin. With the addition of the new clinic in Bangalore, Kaya’s skin care solutions will now available at 87 clinics across 26 cities in India.